Hi everyone! It is Kali here with you to share my final layout & card that created with our April 2014 Hip Kit & Add-On Kits. This layout is colorful and graphic. I think that all of the elements together perfectly! I layered the papers together and added photos in frames (crate paper and Jillibean soup). 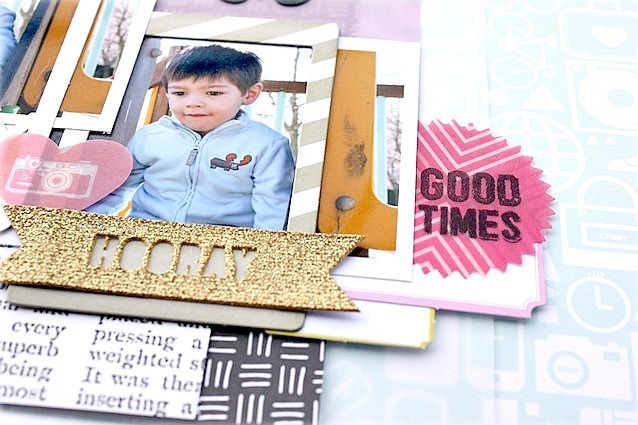 To finish my page I added a few of the Styleboard vellum die cutes from our April Embellishment Add-On Kit along with a gold glitter banner to add a bit of shine.